On Monday, December 7, 2015 members of our congregation met to talk about the next steps for our congregation and approve a ministry plan / budget for the next six months of our fiscal year. Here is a brief overview of that meeting. A couple of minor changes were made to clarify our bylaws. We also added a paragraph that requires and annual review of our congregational governance. You can see the bylaw changes here. Paul Dickerson reported on the result of ULC elections. The chartering team continues to move forward in collaboration with St. Luke. We expect ULC to be receiving donations and paying bills as of January, 2016. We also know a healthy transition will take 6-18 months or more. We look forward to ongoing partnership as separate congregations. 3. Report from Living Water. Pastor Dan Flynn reported on the status of the reform or release question at Living Water. The Living Water Chartering Team has given a recommendation that Living Water charter as an independent congregation. To support the decision of those who attend Living Water, the Chartering Team has put together a Vision Statement and a list of FAQ’s based on questions raised during the survey of households who attend Living Water. That survey indicated that of the 61 households who responded, 75% indicated that, if Living Water charters, they will continue to support Living Water by attending worship, serving in ministry and giving financially. Two forums have been held after services on November 22nd and December 6th in which the Vision Statement and the recommendation to charter were discussed. On December 6, Pastor Justin also attended and discussed what Living Water would be like under the reformed St. Luke Lutheran Church. On December 13 and 20, Living Water will vote by ballot on whether to charter or to be part of the reformed St. Luke. Lutheran Church The Living Water Site Selection Team is actively looking at the Lakeside Saddlery building as a possible permanent location. The congregation voted to delay elections until January 10, 2016. This will allow Living Water to vote on reform or release before we elect our congregational leaders. If you would like to nominate anyone for service on our governance board, the SLC, or as an Elder, please contact the chair of our nominating committee, Deacon Phil Geyer. Pastor Justin Rossow presented an overview of our next six months of mission and ministry. Pastor Rossow suggested four major areas of focus. 1. Investing in Healthy Transition. We are committed to the success of the ministry of St. Luke, Living Water, and University Lutheran Chapel. We need to focus the time, money, and staff resources needed to make healthy transitions. 2. Investing in Leaders. With a newly elected governance board and board of elders functioning under a new set of congregational bylaws, the next six months will be a time of growing in unity as we grow into leadership roles. We will intentionally be investing in both staff and lay leadership long term, but especially over the next six months. 3. Creating a Seedbed for Vision and Direction. Once the final decisions have all been made about reform or release for the multisite, we will need to be able to articulate more clearly for the future what we believe Jesus is calling us to do and to be. While that starts with staff and lay leadership, we want to involve the congregation in catching and shaping the vision of where we think we are going as a congregation and how we think we can best get there. We will not be ready to enter into the more intense visioning process in the next six months, but we want to make decisions that set up that congregational vision process in the near future. 4. Ongoing Discipleship. We need to focus on healthy transitions and leadership development over the next six months, but that does not mean we are letting go of a vision for ongoing, intentional discipleship. We will continue to support and enhance our weekly worship patterns and our daily interaction with God’s Word. We will seek to grow in trusted relationships and joyful service. We will continue to place in front of our people opportunities for generous giving and missional living. In the midst of transition, we are still on the lookout for how Jesus is molding and shaping us as individuals and as a congregation so He can use us in His mission to a world He loves. Homeless Shelter Week, January 18-25: contact Allen Morgan if you or your group are interested in serving. 3rd Saturdays: A time of equipping, planning, fellowship, and celebrating for our staff, all of our leadership boards, and ministry leaders. These Saturdays will be a major tool for developing leaders in the next six months. Epiphany Worship: The road from the manger of Bethlehem to the Mountain of Transfiguration takes us on a journey of following Jesus. Our worship theme will look at stories Jesus told (we call them parables) as a way of discovering The Heart of Jesus for The Broken Road. Lent and Home Groups: Our Lenten theme, Places of the Passion, will help us see and follow Jesus in the Gospel of Luke. Along with an In-Home Maundy Thursday worship option, we will also be resourcing midweek Lenten worship both at church and in-home Groups. We want to continue developing discipling relationships as we encounter God’s Word together. Marriage Retreat, March 11-12: Once again we will partner with some other local congregations to support and develop our marriage relationships. This year, Knox Presbyterian will host the event, and we intend to send a strong St. Luke contingent! In His Service and Vacation Bible School will both be a little earlier this year because of the National Youth Gathering. In these and other ways we are committed to supporting families as they grow in following Jesus together. As we did in our last six month budget, we are committed to staying within some rather large spending parameters rather than submitting a long list of specific ministry plans. This allows us the flexibility of adjusting ministry in a time of transition while ensuring we have what we need to support the discipleship life of the congregation. After giving an overview of the major areas of focus and some of the specific plans for mission and ministry, Pastor Rossow shared a joint St. Luke, Ann Arbor / Living Water six-month budget. Even if Living Water affirms the recommendation of their Chartering Committee to charter as an independent congregation, that transition will take several months, so a joint spending plan seems most reasonable as a next step. In general, the budget covers four main areas of spending. 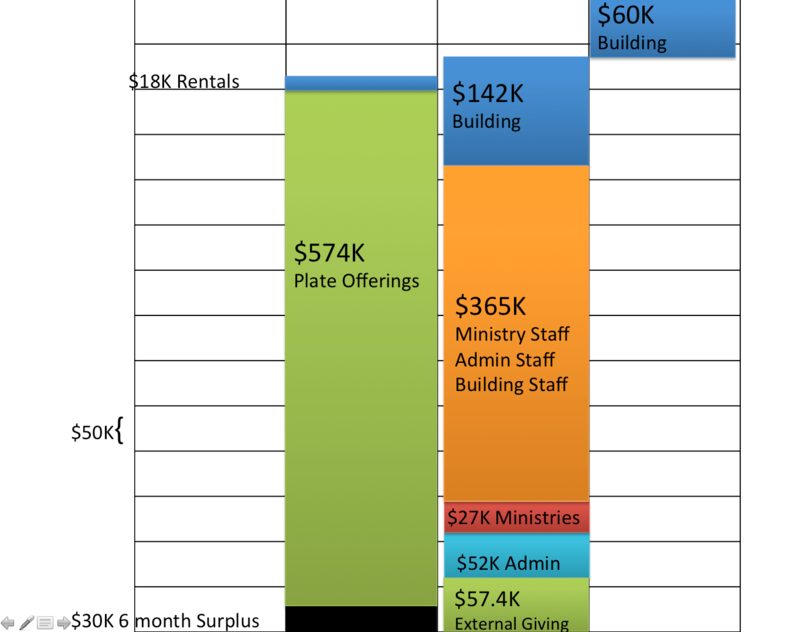 If we divide our staff by what they do and align that with other expenditures, we spend about 16% of our budget on administrative costs and staff; about 31% on building-related costs and staff; about 43% of our budget on ministry spending and ministry staff; and 10% of our plate offerings go directly to ministries outside of St. Luke. We are expecting to balance income and expense over the next six months. On the income side, we know that the second six months of our fiscal year (that starts July 1) accounts for about 47-48% of our annual giving revenue. Therefore, we typically carry over about $30,000 from the first six month of our fiscal year. In addition to that $30,000, we are projecting $574,000 in plate offerings at Living Water and St. Luke combined. About $18,000 in rental income is also projected for that time period. On the expense side, we are budgeting 10% of our plate offering, a tithe, to go to ministries outside of us: that would be $57,400. Added to that, we are planning on spending $56,000 in administrative costs and $31,400 in ministry spending. Our two largest spending areas include staffing and building costs. Ministry Staff, Administrative and Support Staff, and Staff directly related to the building, all combined, including salaries, benefits, and health care costs, totals $365,000 for the next six months. Building expenses, including rental in Whitmore Lake and mortgage payments, utilities, and upkeep in Ann Arbor, total $194,400 for the next six-month period. All told, our initial expenses exceed our projected revenue by just over $83,000. Pastor Justin presented a plan to address that deficit that had already been approved by our multisite Admin Board, the St. Luke Financial Advisory Team, and the current governance board, the SLC. On the expense side of the column, Pastor Justin noted that St. Luke is taking on all of the staff that was not site-specific. While in the long term the congregation will have to make decisions about the kind of staffing we need and can support, Pastor Justin suggested that it is best to staff toward vision and direction. Since we are entering into a time of developing the vision and direction for the congregation, Pastor Justin presented a plan to the voters that kept our staff spending the same for the next six months. In order to balance our planned spending and anticipated income, Pastor Justin made two recommendations: first, on the expense side of the ledger, he suggested we go to interest only payments on our mortgage. Deferring those costs allows us to reduce our planned spending by $60,000 in the next six months. Pastor Justin noted that there is a strong desire to enter into an aggressive capital campaign to attack our debt; the key component in that kind of capital campaign being a clear vision and direction. The second recommendation, on the income side of the ledger, is a return to something that has worked well in the past. Two years ago we held a special giving dinner that raised $60,000. If we hold a giving event of some kind this spring that raises even $23,000 we would be able to match our projected income with our planned expense. With input and discussion from our congregation, this ministry plan and budget passed unanimously. Pastor Rossow also reported that the SLC had officially declared a vacancy in the Senior Pastor position and that the Board of Elders would put together a call committee and call process beginning in January. The meeting ended in prayer and a song of praise. Thank you to all who took time to participate in this discussion and vote. We are excited to see where Jesus is leading us next!